Rest comfortably in this approximately 350-square-foot handicap equipped room, with one king Hyatt Grand Bed®, accessible bathtub, free Wi-Fi, and our Cozy Corner Sleeper Sofa. Spread out in this approximately 350-square-foot handicap equipped room with two queen Hyatt Grand Beds®, accessible bathtub, free Wi-Fi, and our Cozy Corner Sleeper Sofa. Feel at home in this approximately 550-square-foot handicap equipped room, with one king Hyatt Grand Bed®, accessible roll-in shower, free Wi-Fi, and our Cozy Corner Sleeper Sofa. Relax in this approximately 500-square-foot handicap equipped room, with two queen Hyatt Grand Beds®, accessible roll-in shower, free Wi-Fi, and our Cozy Corner Sleeper Sofa. 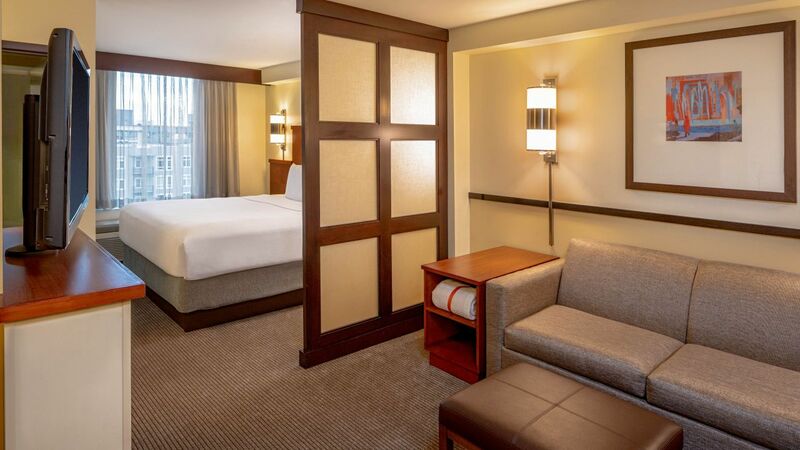 Unwind in this approximately 550-square-foot room, with separate sleeping and living areas, one king Hyatt Grand Bed®, 42" flat screen TV, and our Cozy Corner Sleeper Sofa. 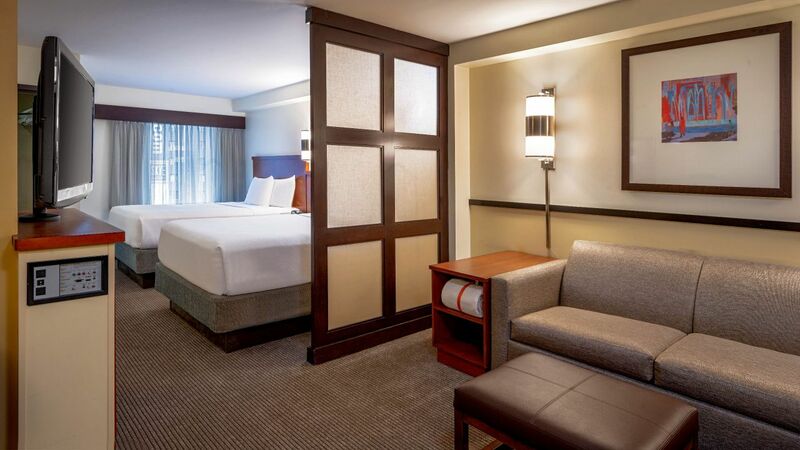 Relax in this approximately 500-square-foot room, with separate sleeping and living areas, two queen Hyatt Grand Beds®, a 42" flat screen TV, and our Cozy Corner Sleeper Sofa. Enjoy the views from the approximately 600-square-foot room, with one king Hyatt Grand Bed®, state-of-the-art media center, free Wi-Fi, and our Cozy Corner Sleeper Sofa.